LUCCA, Italy, Jul 29 2014 (IPS) - “Only two years ago, the soup kitchen was serving 50 meals a day. Today the number has almost doubled and, what is even more worrying, we have started receiving families with children,” says Donatella Turri, director of the Caritas Diocese of Lucca. The paradox is that the lengthening queues at the Lucca soup kitchen come against a backdrop of increasing food loss and waste. “It means that the poor are no longer the homeless, the mentally ill and the drug addicts. More and more often we get requests for primary goods from families that simply cannot reach the end of the month with their salaries,” she told IPS. Turri’s claims are confirmed at the national level by the yearly Italian National Institute of Statistics (ISTAT) report on poverty. According to the survey, absolute poverty [the threshold below which a family cannot afford the goods and services that are essential to guarantee a barely acceptable standard of living] has maintained its steady increase in recent years, rising from 4.6 percent in 2010 to 7.9 percent in 2013. “The traditional distinction between the quantitative aspect of food security being typical of developing countries, and the qualitative one being a concern of the industrialised world, is fading away,” Andrea Segré, Dean of the Faculty of Agriculture at Bologna University and President of Last Minute Market, a company that recovers unsold or non-marketable goods in favour of charity organisations, told IPS. However, while access to food is also becoming increasingly difficult for the low-income class of developed countries, the Food and Agriculture Organization (FAO) reports that Europe, North America and Oceania are top of the world’s food wasting classification, with a per capita food loss of almost 300 kg per year in North America. “Food loss and waste are dependent on specific conditions and local circumstances,” Eliana Haberkon from FAO’s Office for Communications, Partnerships and Advocacy, explained to IPS. Currently, the biggest gap between rich and poor nations remains the quantity of food wasted at the consumer level. According to FAO figures, Europeans and North-Americans waste between 95 to 115 kg of food per capita every year, while in sub-Saharan Africa and South/Southeast Asia the number drops down to only 6 to 11 kg a year. At the beginning of July, Last Minute Market, in cooperation with the SWG survey company, published a report called ‘Waste Watcher’. Using a complex questionnaire survey among Italian consumers, the outcomes paint a comprehensive picture of the social dynamics and behaviour of families that lead to food waste. 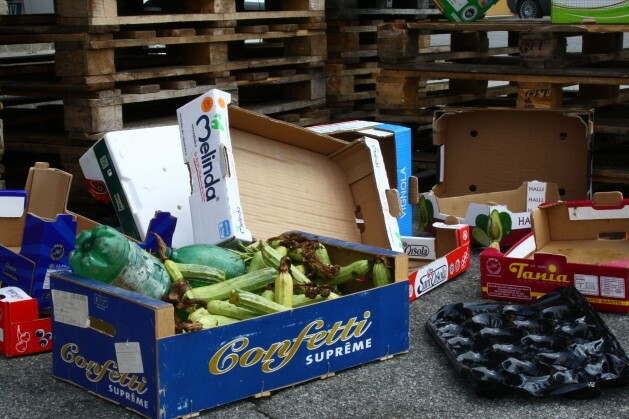 “The overall waste of food in Italy is worth 8.1 billion euro every year, and most of it comes from our houses. The rest of the losses, in agriculture, industries, distribution and service, can be recovered, but it is much less significant than what we throw in our bins,” said Segrè, commenting on the survey results. Last Minute Market is now working to prepare the ground for a discussion on food waste during EXPO 2015, which will take place in under the heading ‘Feeding the planet, energy for life’. Do Not GM My Food! Studies by FAO estimated a yearly global quantitative food loss and waste of 30 percent of cereals, 40-50 percent of food crops (fruits and vegetables), 25 percent of oil seeds, meat and dairy products and 30 percent of fish. Both Last Minute Market and Caritas agree on the paramount role of education in tackling food waste. In cooperation with more than ten local primary schools, the Caritas Diocese of Lucca has managed to recover excess food intact from school canteens for a value of 40,000 euro, taking it to the soup kitchens it manages. This initiative has allowed it to develop a parallel food education project with the children of the schools involved. The large amount of fresh food waste is a lose-lose situation for the environment, the struggling families in today’s tough economy and for the food retailers. There is no single cure, or silver bullet for food waste reduction therefore, we should address the food waste problem in every link in our food supply chain. For example, the excess inventory of fresh perishables close to their expiration on supermarket shelves, combined with the consumer “Last In First Out” shopping behavior, might be the weakest link of the fresh food supply chain. The new open GS1 DataBar standard enables applications that encourage efficient consumer shopping by offering him automatic and dynamic purchasing incentives for fresh perishables approaching their expiration dates before they end up in a landfill. encourages efficient consumer shopping behavior that maximizes grocery retailer revenue, makes fresh food affordable for all families and effectively reduces the global carbon footprint. There are 10,000 people dying everyday due to hunger and malnutrition. This short film shows a forgotten portion of the society. The people who live on the refuse of men to survive. What is inspiring is the hope and spirituality that never left this people.This film is about the hunger and poverty brought about by Globalization.